Makers, small batch manufacturing, and slow fashion are stronger and more popular than ever, but there are still major blows inflicted from the fast fashion machine. Just last week, Cone Mills announced the closing of the 112 year old American denim mill in Greensboro, NC. While this is a major blow to those of us in the fashion industry supporting local jobs and manufacturing, we soldier on. There is a new trend catching on: the “Open Kitchen” concept in retail and how that adds to the storyline that is so important in modern day advertising. Queen Bee Creations, created in 1996 by Rebecca Pearcy, has always had their manufacturing visible in their retail space. It is an incredible experience. 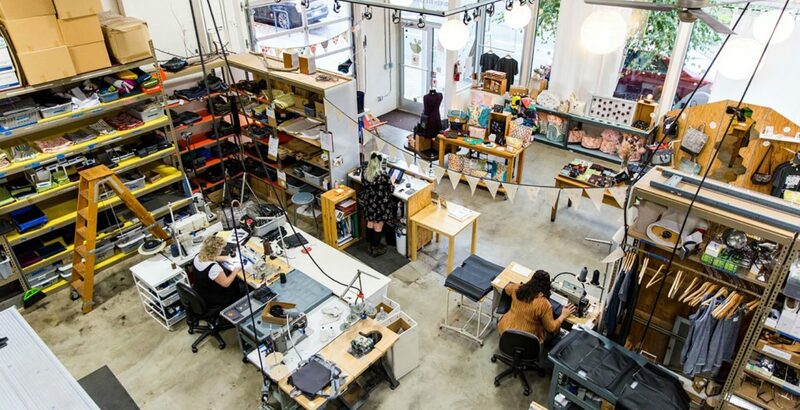 You walk in, and at first it feels like any other retail space, but as you wander around, you realize the purchase counter is completely open to a manufacturing space, complete with white boards filled with plans, fabric being screen-printed, and workers on industrial sewing machines. Queen Bee bags are legendary for how long they last. If you find a Queen Bee bag owner, you’ve found a Queen Bee brand advocate for life. I asked an owner of a Queen Bee bag recently about her purchase, and she echoed what I’ve heard many times, “They last so long, I almost can’t wait for it to fall apart so I can buy another one!” Rebecca speaks to the Open Kitchen concept saying, “this shows the buyer, look, it is possible for your goods to be manufactured here and still be affordable.” It gives the buyer a connection to the process, the people involved, and a connection to their product. This Open Kitchen is key in bringing in new customers. Rebecca says she’d never consider outsourcing her manufacturing, and instead brings in other brands and even co-brands with other retailers so they can too have local manufacturing. Queen Bee sells online and some wholesale to American boutiques, as well as the occasional International show. She has hired a PR company before, but finds for a company her size, the Queen Bee audience is more on Instagram and Facebook, and focuses her marketing hours on social media and her website. When Queen Bee co-brands with another retailer, such at Eight Generation in Seattle, they will launch social media campaigns and photography together. Andrea Moore Beaulieu, the designer and creator of Moore Custom Goods, has had a retail space for over 3 years with a similar Open Kitchen concept and as much local sourcing as possible. A customer can come in, request a custom fitted item from one of Andrea’s lines, or something completely new, all while the material, machines, and sewists are there in-house and visible. Her advertising started small with ala carte pay-to-play from FashioNXT, and she has recently grown enough to hire a PR agency. She says it was important when starting out to get her name out there and grow a brand image, but now that she has traction, it makes sense for her to tell her story through a larger channel. Like with other small batch manufacturing stories, Andrea wants to highlight an item, but the storyline and experience is what is most important to get to her customer. She doesn’t feel it is necessary to convert the fast fashion consumer, but to give the consumer that is ready for an American made, custom experience the most memorable experience possible. Her space allows for that face-to-face, tangible connection to the clothing being made. Elizabeth Suzann, while only an online store, has an Open Kitchen concept on social media, and it works. While the brand only launches a few lines a year, everything is made in their Nashville, Tennessee shop to order. Elizabeth Suzann wrote an in depth piece during #whomadeyourclothes week, and consistently shows complete transparency by sharing creative planning, manufacturing, and process photos on their Instagram, Facebook, and Pinterest accounts. The brand’s blog is packed with detailed stories of each line, each person on the team, and regularly updated with the entire process. We are too late to save the American Cone Mills jobs, but there’s a good lesson here for all interested in saving local jobs, wherever that may be. Silence is deadly. Show transparency, have an Open Kitchen, get on social media, hire a PR agency and TELL YOUR STORY. Create new authentic emotional ties, and create new consumer habits with transparency and telling the makers story.